Computation of anomaly correlations include use of monthly depth interval (layer) climatologies. These were derived from the World Ocean Atlas data. Validation of the CMEMS Arctic MFC results for ocean temperature, salinity and mixed layer depth is performed using data from profiling buoys, which are compiled by the CMEMS In Situ TAC. New sets of buoy data are available daily, while each buoy provides one profile for each 10-day period. The data are available from Argo buoys, with most buoys covering a depth range of 0-2000 m. Read more about the Argo project here. Bias is defined as averages of model values - observed values. Profile data are available from ftp.nodc.no (ftp server, password required) for the northern North Atlantic and northwards. This data compilation is distributed by the Norwegian Marine Data Centre (NMD) at the Institute of Marine Reseach (Norway), in collaboration with Coriolis who operates the CMEMS In Situ TAC. Data may also be downloaded as part of the product INSITU_ARC_NRT_OBSERVATIONS_013_031, and from a web interface to the NMD data (in Norwegian). The ARGO program does not provide observations from shelf regions. Therefore, the above validation is complemented by comparisons of model results and CTD profiles from scientific-level cruises. These validation statistics is updated on a quarterly basis. Maps show temperature and salinity bias averaged over the water column from 5 m depth to 2000 m depth, or the bottom (model or actual) or maximum CTD depth in places where the bottom (model or actual) or maximum CTD depth is less than 2000 m. For the mixed-layer depth comparison, the bias is set to zero if both the model and observations indicate mixing to the bottom, irrespective of any differences in model and actual bottom depth in the position. CTD data are downloaded from the CMEMS product INSITU_ARC_NRT_OBSERVATIONS_013_031. The ARGO program does generally not provide observations from the Arctic Ocean. Therefore, the above validation is complemented by comparisons of model results and observations from Ice Tethered Profilers (ITPs). Read more about Ice Tethered Profilers here. ITP data are available from ftp.nodc.no (ftp server, password required) for the Arctic Ocean. This data compilation is distributed by the Norwegian Marine Data Centre (NMD) at the Institute of Marine Reseach (Norway), in collaboration with Woods Hole Oceanographic Institution (WHOI) who coordinates the ITP program. Data may also be downloaded as part of the product INSITU_ARC_NRT_OBSERVATIONS_013_031. 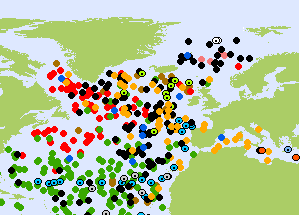 The present locations of active ITPs are shown on a map from the web pages from WHOI. However, note that there are rarely any ARGO profile data north of the Nordic Seas, so almost all ARGO observations are either inside of the green region, or in the North Atlantic Ocean and the Labrador Sea (the part of the blue region to the south and to the west of the Nordic Seas). A sample map of the distribution of ARGO profiles (right) illustrates this limitation. ITP data are available from the Arctic Ocean only.